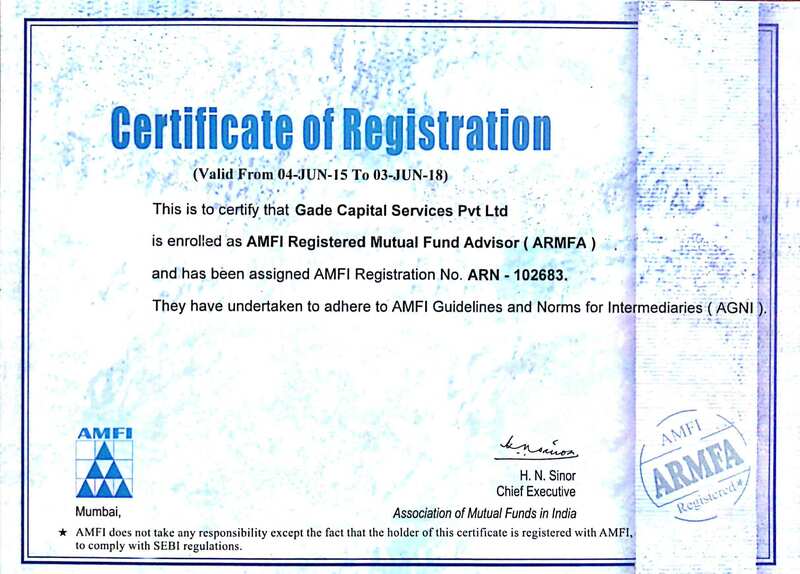 Gade Capital Services Private Limited, an Indian company ("Gade Capital") recognizes the importance of your privacy and is committed to ensuring that you are aware of how your User Information is being used. The policy does not apply to, nor does Gade Capital take any responsibility for, any information that is collected by any third party either using the Website or through any links on the Website or through any of the advertisements. In the use of the Website, as you navigate through the Website, Gade Capital may collect different types of information from you. This may include Personal Information, Sensitive Personal Data, information on the usage patterns of any user of the Website including you, searches that you have done on the Website, advertisements or third party links that you have visited, any emails or other correspondence you have exchanged on the Website or with Gade Capital. For the purposes of this policy, (a) Personal Information shall include your name, age, gender, telephone numbers, location data, or email addresses. (b) Sensitive Personal Information shall include your financial information such as Bank account details and any other financial information required by Gade Capital for your use of the Website. Including cookies helps Gade Capital continually improve the Website and better your user experience. The Website utilises "first party cookies" (originating from the Website) to track your visits between sessions and deliver a more personalised experience. The Website may also utilises "third party cookies" (not originating from the Website) to provide "analytic" information. You also may provide information to be published or displayed or posted on the Website, or transmitted to other users of the Website or third parties. Any such information is posted or transmitted to others at your own risk. Please be aware that Gade Capital cannot control the actions of other users of the Website with whom you may choose to share information. The information that we collect on the Website will be used for the purposes of operating the Website, facilitating Your use of the Website including any transactions you may undertake by such use, studying user behaviour, and for other business purposes of Gade Capital. Except as otherwise provided herein, no Personal Information or Sensitive Personal Data will be disclosed or shared with any third party without your express consent. Gade Capital will not publish, sell or rent your Personal Information to third parties for their marketing purposes without your explicit consent. Gade Capital may also use the information for analytical purposes, including but not limited to assessing usage data, usage patterns, estimate audience sizes and other similar activities. You agree that we may use your Personal Information to contact you and deliver information, targeted advertisements, administrative notices and any other communication relevant to your use of the Website. If you do not wish to receive these communications, you can at any time change your profile settings or unsubscribe from the same. The information you provide on the Website may be disclosed by Gade Capital to its agents, employees, third party advertisers, subsidiaries and affiliates, or to other third party service providers of Gade Capital who require the information for the purposes of operating and maintaining the Website and for facilitating any transactions that you may wish to undertake through the website. Gade Capital will comply with requests and directions of all governmental, law enforcement or regulatory authorities, which it believes in good faith to be in accordance with any applicable law. Such compliance may include providing Personal Information, Sensitive Personal Data, or any other information to such agency or authority. Without prejudice to the earlier portion of this paragraph, Gade Capital may store and disclose your Sensitive Personal Data in order to comply with any law or statute applicable to it. By providing any information on the Website, You consent to Gade Capital disclosing such information to any governmental, law enforcement or regulatory authorities who exercise jurisdiction over Gade Capital and the Website. Gade Capital uses third party cloud servers for storage of the information collected by it and such third parties are governed by their own privacy and security policies which are available at www.digitalocean.com. Gade Capital offers no representation, warranties or other assurances that the security measures are adequate, safe, fool proof or impenetrable. You may change, alter or otherwise modify or update the information you submit to the Website any time by accessing the Website using your registered username and accessing your user account. Gade Capital at its sole discretion may permit or deny the change of any information, if it is believes the same is required to observe applicable laws. The Website is only intended for users who are of 18 years of age or older. If you are not of the requisite age you are not to provide any information on the Website. If it comes to Gade Capital’s attention that any information pertains to an individual under the age of 18 years, such information or will be deleted without notice to you.